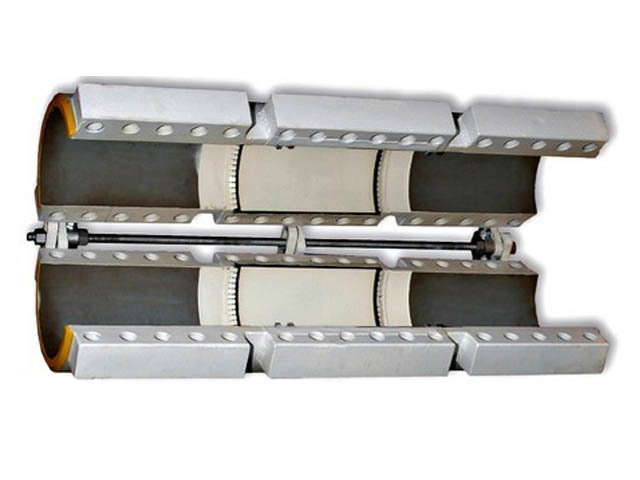 PLIDCO® Clamp+Sleeves are designed for coupling pipe. Utilizing clamping surfaces to grip the outside pipe wall, PLIDCO® Clamp+Sleeves provide exceptional holding power without danger of caving in pipe. They counteract extraordinary end-pull and unusual axial stresses often encountered in offshore installations. PLIDCO® Clamp+Sleeves can also be used to seal pipe leaks and reinforce badly damaged pipe. Installation is made by simply mating the halves together, without special tools. Steel GirderRings hold the packing securely in place during installation, assuring a gas tight, liquid tight seal. Hinges can be furnished to aid in installation. Standard working pressure is 1000 psig. Higher working pressures and special sizes are available on application. Buna-N packing is standard; other packing material upon request. An independent laboratory test of a 12” PLIDCO® Clamp+Sleeve was made using two bull plugs coupled together with the PLIDCO® Clamp+Sleeve. Hydrostatic internal pressure was maintained at 4425 psig, and axial load was applied to 625,000 lbs. before any perceptible slippage was evident. No leakage occurred at any time during the test.